I was asked many times before when joining in discussion at some software & computer forums about how to use AV Voice Changer Software 8.0 Diamond for imitating, to simulating or modulating the voice of Bane - a very very masked bad guy in Batman movie (The Dark Knight Rises) but has a really cool voice. However, at that time, when I was asked, I have no idea of how Bane, his voice would sound like until when I had a chance to watch it on TV last week. And, for a very quick decision, I see that I should write this post quickly for my blog and for my readers. After my amateurish analysis, I can see that there is something similar in Bane's voice and some other famous voice topics that I wrote, for instance, Best Voice-over Tool For Imitating Optimus Prime's Voice, How To Talk Like Darth Vader (Star War Movies) In 60 Seconds. So, it would be just some tweaks with the Voice Changer Software Diamond's settings to archive Bane's voice for output. A good Bane voice changer could be absolutely set up if you follow the below steps solely. **If you are going to use the voice changer program for making prank calls on VoIP application or instant messengers or ingames, it is recommended that you should not skip this step. On the program's main panel top-menu, select Preferences. Then, on the VCS Settings dialog box, make sure that Virtual driver Mode (1) is selected. Hit Apply and OK button (2) to apply the new settings. 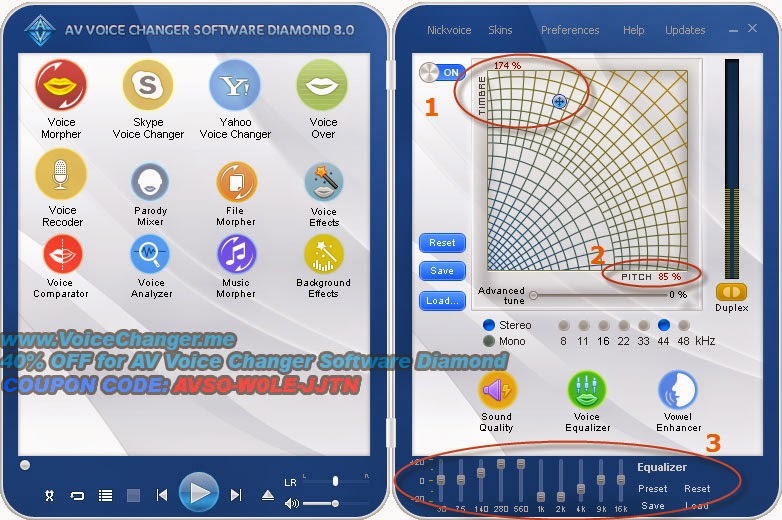 **Do you know that AV Voice Changer Software Diamond with its Hooking algorithm used to be king of the real-time voice changer programs for years? Hooking algorithm allows the program to intercept output/input streams of any PC applications and change them (put effects on them) at your will. However, for the time being, the Virtual Driver solution is highly recommended in all cases for its well compatibility, stability and quality. 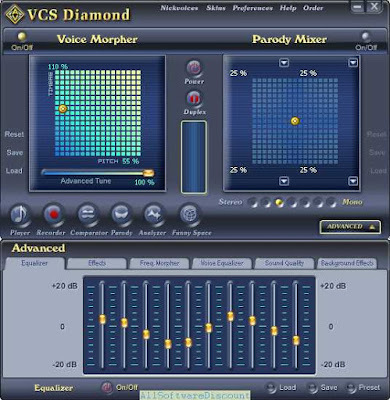 Run the Voice Changer Software Diamond program. Make sure that the program status is ON by checking the ON/OFF button at top-left of the program's right-hand-side panel. Move the cursor on the Pitch-Timbre graph (also called the Morpher graph) to change the voice. For me, Pitch = 174%, Timbre = 85 % and Advanced tune = 40% is good enough. Within the Equalizer (3), click on Preset and select Tender. 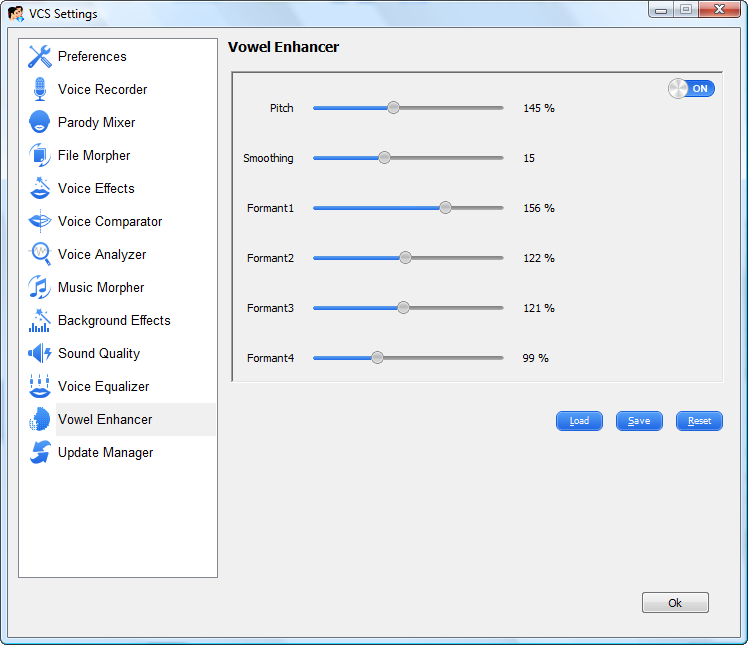 Go to Preferences, Voice Effects, expand Tremolo effect folder and enable Tremor effect. You are now very close to a good Bane voice changer software. While adjusting the Pitch & Timbre, you can turn the Duplex ON to preview the changes in real time. Then make more necessary changes still getting the result voice that you like best. And rest assured that you do not miss the premium add-on section where you can download many more voice & audio effect to use for enhancing your voice output quality. 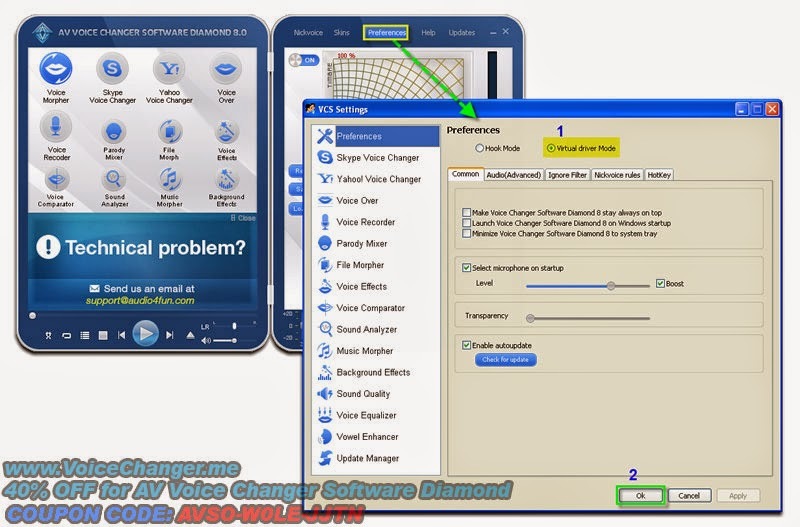 **This is the very useful features that only AV Voice Changer Software 8.0 Diamond has. You will not able to find this in any Bane voice changer; neither in software program nor in hardware. There are various environment sound files ready-to-use in this section. However, for Bane's fans, we see that the sound files, for example, cracking noise, fighting sound, ambient background music are really cool. You may find them from the Internet or you can also extract them from your favorite movies. To load the background audio, click on Background Effects icon via the Left panel. Click on Add Effects button and browse to your sound files, for example, cracking noise, fighting sound, ambient background music. 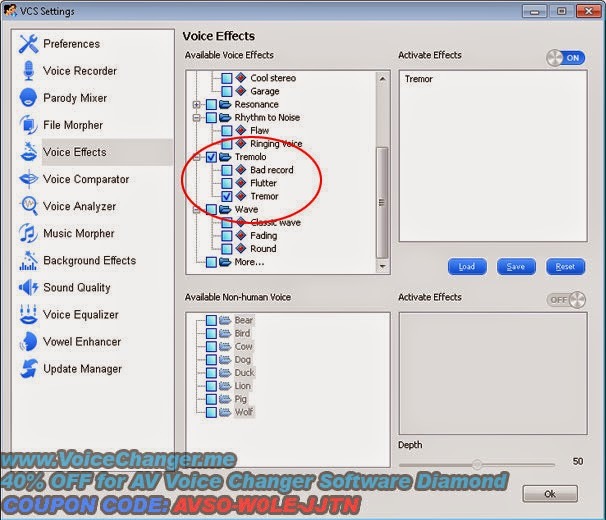 Buy Full version of the Bane voice changing program (AV Voice Changer Software 8.0 Diamond) now!